russia – TRUTH IN MEDIA: TRUTH TRUMPS POWER EVERY TIME! STOP ROCKING THE BOAT… CALLED EARTH! Putin unveiled a number of new nuclear weapons that Russia has as added to its arsenal in the last 15 years. Russia has now countered this, according to Putin, who went on to present a number of new systems, some of which don’t yet have names, and which are all meant to counter current and future ABM systems. His speech was accompanied by a series of video clips showing those new systems, partially as footage of tests and partially as computer-generated images showing their capabilities. After his tough talk, the Russian president then offered the US an olive branch. He stressed that Russia would not need all these new weapons if its legitimate concerns had not been ignored by the US and its allies. “Nobody wanted to talk with us on the core of the problem. Nobody listened to us. Now you listen!” he said. PUTIN’S SPEECH TO FALL ON DEAF EARS IN THE US? The US powers that be know no other way of life but the use of force and coercion. Chances are, therefore, that Putin’s words will fall on deaf ears in Washington and New York. Warmongers will be warmongers until they self-destruct. Just as Hitler’s Third Reich did over 70 years ago. Meanwhile, it is an instructive coincidence that on this day in 1996 – yes, 1966 – over three years before the US Apollo mission to the Moon – Venera 3, a Soviet probe launched from Kazakhstan on November 15, 1965, crash-landed on Venus. Venus is the second planet from the sun and the closest planet to the Earth both in size and distance. Although Venera 3 failed in its mission to measure the Venusian atmosphere, it was the first unmanned spacecraft to reach the surface of another planet. Four years earlier, the U.S. probe Mariner 2 was the first spacecraft to pass close enough to Venus to take scientific measurements of the planet, discovering surface temperatures in excess of 800 degrees Fahrenheit on its surface. In 1967, Venera 4 succeeded where Venera 3 failed, successfully ejecting several scientific instruments, including a thermometer, a barometer, an atmospheric density gauge, and gas analyzers, into Venus’ atmosphere. Then, in 1970, Venera 7 became the first spacecraft created by humans to soft-land on Venus, successfully sending back images and data for 23 minutes before succumbing to the extremely high temperature and atmospheric pressure found on the planet’s surface. How significant are these Russian achievements from more than half century ago? Enormously. When the US spacecraft landed on the Moon in 1969, it had traveled an average distance of 239,000 miles. When Venera 7 soft-landed on Venus a year later, the Russian spacecraft had traveled for 120 days covering the distance of between 25 million and 162 million miles (Venus’ orbit is elliptic, so its distance from the Earth varies greatly). Assuming that Venera 7 took the shortest possible route, it still means that the Russian spacecraft had traveled at least 105 times (!) farther to reach Venus than the US missions to the Moon. Bet you never learned facts like that in myopic and chauvinistic American schools? And it’s that kind of ignorance that breeds arrogance that can eventually kill us all. So when Putin says Russia now has capabilities of nuking the US via the South Pole, the American warmongers had better take him seriously. Thank God there is at least one sane person among the world leaders who have the power to destroy the planet. But will Putin enough? Or will the “big stick” which he revealed today become yet another excuse for more military spending in the US? My bet is it will be the latter. Trump has already beefed up the Pentagon budget during his first year in office. And Putin has now given him another reason to accelerate the new arms race. In the first military action in the (then) 45-year history of the North Atlantic Treaty Organization (NATO), U.S. fighter planes shoot down four Serbian warplanes in Bosnia. The United States, 10 European countries, and Canada founded NATO in 1949 as a safeguard against Soviet aggression. With the end of the Cold War, NATO became obsolete… a military solution in search of a new problem. Since none came forth, the United States invented a new mission for NATO: “Peacekeeping”. Which was a euphemism for entering a civil war which was raging in Bosnia at the time on the side of the Muslims. And later on the Croats, too. Alas, there was no peace in Bosnia back in the early 1990s. With its recognition of Bosnia’s independence in April 1992, the U.S. government ignited a three-way civil war. The Bosnian Muslims, Croats and Serbs had been duking it out for nearly two years by this date in 1994.. The Serbs were winning on most fronts. The Bosnian capital Sarajevo, for example, which the Muslims held as they were the majority of the population there, was under siege by the Serbs. So were several other Muslim enclaves in eastern Bosnia. That’s when Bill Clinton and his warmonger-in-chief, Madeleine Alright aka Madam Halfbright, stepped in and stepped up – by giving NATO a new mission: Protect the Muslims and Croats. Of course, in a typical New World Order double speak, they called it “peacekeeping.” Which at this stage of the war meant enforcing a “no fly” zone which NATO imposed over Bosnia in order to diminish the Serbs’s military superiority. In 1994 and 1995, NATO planes enforced the no-fly zone over Bosnia-Herzegovina and struck at Bosnian Serb military positions and airfields on a number of occasions. On February 28, 1994, the first of such aggressive attacks took place. “If it was a test, I think we passed the quiz,” Adm. Jeremy M. Boorda, the senior NATO commander for Southern Europe, who oversaw operations in Bosnia, callously old the New York Times. Ironically, less than two years later, this NATO commander committed suicide at his office when it was revealed that he was wearing some military decorations he had not earned. The American F-16’s came from a NATO base in Aviano, Italy, that comes under Admiral Boorda’s command (see NATO CRAFT DOWN 4 SERB WARPLANES ATTACKING BOSNIA https://nyti.ms/2FFz1UP). By August 1995, NATO’s “peacekeeping” would escalate into a full scale war with massive bombing of the Bosnian Serbs’ held area. It was such brute force that eventually brought the Bosnian war to an end. After the US-forced Dayton Peace agreement was crafted in late November 1995 in Dayton, Ohio, NATO had a green light to expand into a new territory in eastern Europe. It was the first of many NATO expansions into eastern Europe and toward the Russian border. The action the NATO F-16 jets took on this day in 1994 was the first of many belligerent actions and provocations that showed the world that NATO’s new mission was the same as the old one – aimed against Russia (see PROOF OF OUR 1994 “DRANG NACH OSTEN” THEORY: NATO TO EXPAND TO FORMER SOVIET STATES, SUSPEND COOPERATION WITH RUSSIA. Apr, 1994 and Apr 2014). Except for my musical/ballet creation Chopiniada, which coincided with the Winter Olympics in Korea, I have refrained from commenting on this thoroughly corrupt event. Because these shamefully politicized and commercialized “games” are not worth even a comment. They only deserve our scorn and oblivion. I never watched any of it on live TV. We don’t watch any network TV and have not had it for years. I only followed them through online media headlines here and there. But there was at least one bright light worth a comment – the 15-year old Russian figure skating Olympic champion. As you can see in this interview, the 15-year old Alena sounds smarter and more mature than most 30-year olds or older anywhere in the world these days. RT: Alina, thank you very much for this opportunity, it is a great honor. You’re 15 and you’re an Olympic champion. Honestly, what’s on your mind? Alina Zagitova: The most important thing to me has been to just make sure that everyone, my coaches, the audience and myself are satisfied. What’s on my mind? I’m thinking about the next season, and new tournaments. I’m thinking of some things that maybe I should change. RT: And that’s all? So, you’re thinking about figure skating and nothing else? AZ: Right now, I just can’t think of other things. AZ: Yes, it’s ok. I don’t really think much of it. AZ: I just made some conclusions based on my experience, even though it’s not that big yet. AZ: To be honest, I didn’t have any tears, not even one. AZ: Well, just a little, my eyes welled up a bit. But overall, it’s probably just because of my character; I tend to keep emotions to myself. But when I come back home, I let them all out, and I share it all with my parents. RT: And what will it be like this time? I can’t even imagine. AZ: I don’t know yet. I’m still away from home. I’ll probably run and jump around happy. I really hope that by the time I get home it will kick in. RT: You mean to say that it really hasn’t yet? And you haven’t been running and jumping around? Honestly. RT: Oh yeah. So there was nothing like, maybe, back in your room, you just went like “I did it!” or texted someone a happy audio or video message? The people you talk to. The doping scandal that keeps many Russian athletes from competing in top events, including the ongoing Winter Olympics, was just part of the West’s devious strategy against Moscow, Russia’s foreign minister has said. 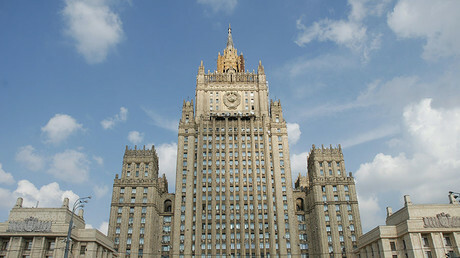 Lavrov believes that the US and other Western powers are now fighting dirty because they cannot deal with the fact that Russia resurged after a low point in the 1990s, when much of its government was influenced by various foreign advisors pushing the agendas of their native countries. Russia has since realized it was “not a newborn country but a nation with a thousand-year long history” that its citizens should be proud of. WHY DID THE BALKAN WARS HAPPEN? In conclusion to the excerpts from my wartime diaries, I will try to answer a question some of you have been asking: Why did the Balkan wars happen in the 1990s that led to disintegration of Yugoslavia, a country cobbled together after the Treaty of Versailles in 1918, and a founding member of the United Nations. If a picture is worth a thousand words, here’s the answer to the above question. During the years I worked as a war correspondent and geopolitical commentator (1989-2002), I had written literally hundreds of articles and hundreds of thousands of words on that topic. It would be, therefore, nigh impossible for any of you to distill the truth and the answer to my title question without spending enormous amounts of time researching this topic. So let me try to answer it succinctly, paraphrasing almost word-for-word my comments about the Dayton Peace Agreement signed on Nov 25, 1995 – 22 years ago almost to the day – https://www.truthinmedia.org/Bulletins/tim95-11.html. “The former Yugoslavia, and especially Bosnia, represents an important strategic link between NATO’s western and eastern wings (connecting Turkey and Greece with Italy and the future NATO members – Bulgaria, Macedonia, Hungary). It so happens that the same route, the so-called “Green Interstate,” also connects the various Muslim enclaves between Bosnia and Turkey (see the map, also published with that 1995 article). The Bihac-Sarajevo-Gorazde-Pristina-Skopje-Instanbul line marks the way Islam is supposed to expand from Turkey into Europe. That’s why the Sarajevo Muslim government fought tooth and nail to keep Gorazde and Bihac, while giving up relatively easily on the less strategic enclaves of Srebrenica and Zepa (further north). But that was just a cover story. The real reason was that following the disintegration of the Soviet Union, the territory of the former Yugoslavia represented a political vacuum. And NATO, meaning Washington, wanted to grab it before the Russians did. That is why the Serbs, the largest ethnic group in Yugoslavia before the wars (40% – see the map) were picked as Designated Villains. It was because of their Orthodox Christian faith and the traditional friendship and alliance with Russia. The rest was just a smoke screen – the way the forces of the New World Order sold this war to the local Yugoslav and the world. And the proof is in the pudding, or Kosovo in this case. In that same 1995 article (“Green Interstate”), written on the day the Bosnian war officially ended, I predicted that the next Balkan war would be over Kosovo. Lo and behold, in 1999, the entire NATO threw its military might against Serbia in order to grab this strategically important Serbian province. Now, 22 years later, the US base Bondsteel in Kosovo is the largest military installation Washington has built in Europe since WW II. Furthermore, Washington and its vassals have even minted Kosovo into a new “country” although more than half the world (geographically – see the map) is still refusing to go along with such a land grab. Also, Slovenia, Croatia, Bulgaria, Romania and Albania are all now NATO countries, in addition to Turkey and Greece which had been NATO members before the Yugoslav wars. Which means the US has now achieved its strategic objective of cutting off Russia from the Balkans, and therefore, that part of the Mediterranean Sea. And at what cost did US/NATO achieve its strategic objective? At least 140,000 people killed, 2.4 million refugees, and another 2 million internally displaced (see https://en.wikipedia.org/wiki/Yugoslav_Wars). And then the monsters who caused such carnage and suffering (Clinton, Blair, Chirac, Chretien, Schroeder, etc. – see the photo), had the audacity to prosecute others for war crimes? Which is why the verdicts by the International War Crimes Tribunal at the Hague amount to MOCKERY OF JUSTICE, a fig leaf covering the bigger crimes of much bigger criminals. When I filed that editorial “Final word on Yugoslavia’s disintegration: WHY DID THE BALKAN WARS HAPPEN?” (https://wp.me/p3QU1S-2MH) a few days ago, I thought I was done with that topic which I rarely visited in the last 15 years since I stopped working as a war correspondent. But it was not to be. There is a story buzzing around the internet in the last couple of days which is sending the lamestream media into apoplexy. A Serb general, who was convicted by the Hague Kangaroo Court for alleged war crimes during NATO’s bombing of Serbia, has been invited to teach at the Serbian Military Academy (https://goo.gl/8oLoV3 – US News and World Report; or https://nyti.ms/2i0ksUI – New York Times). Do you want to know what General Vladimir Lazarevic’s and his bosses’ General Nebojsa Pavkovic’s real “crimes” were? They made fools out of the NATO pompous asses. Meanwhile, the Serb general who has upset the lamestream media’s and NATO’s apple cart, went on Serbian television recently (Nov 18) and shared in a lengthy interview some additional details about how the Serbian military outwitted the mighty NATO in during the 1999. When the Serbs rolled out their troops and equipment out of Kosovo after the peace treaty was signed in June 1999, “the NATO generals were nearly fainted,” he said. Because after 78 days of bombing, during which NATO dropped 23,000 bombs and missiles, more than 95% of the Serbian military arsenal remained intact. And how did they manage that? By building over 3,000 “dummies’ which left the same imprint on the NATO radars as the real tanks. Ditto re. the phantom MIG’s made out of wood which NATO kept hitting. “That’s what they’ve been mostly hitting with their multi-million dollar bombs,” he said. That, and the civilian targets, I might add. Like these in Nis, the third largest city in Serbia, where NATO used cluster bombs designed for maximum casualties among the civilians (see https://www.truthinmedia.org/Tour-de-Serbia-99/Nis/nis-photos-1.html). Alas, the ground attack never came. Because Bill Clinton and his “powdered prince” Wesley Clark, who commanded the NATO attack on Serbia, didn’t have the balls or the stomach for it. And it’s a good thing they did not. Because it would have been slaughter. And a lot more American and British families would have lost their loved ones. You see, according to General Clark’s and other top NATO estimates, the war on Serbia was supposed to last 7 to 10 days (see https://www.truthinmedia.org/Kosovo/Peace/ps8.html, June 24, 1999). By middle of April 1999, however, both Clinton and Clark and other NATO co-belligerents were already getting desperate. While I was in Belgrade during the bombing (in mid-April), for example, I was contacted over an open phone line by a Washington source who said he had just spoken to Bill Clinton at the White House. My source said Clinton was appealing to Americans of Serbian descent to try to procure a peace negotiations with the Belgrade government. So he wanted to see what I can do while I was on the ground in Serbia. Of course, I refused to do any such thing. Trying to bail out war criminals like Clinton and Clark was the last thing on my mind while their bombs were raining on my native city, But I did meet with two top Serb generals in Belgrade the following day. And was impressed with their resolve to fight on no matter what. 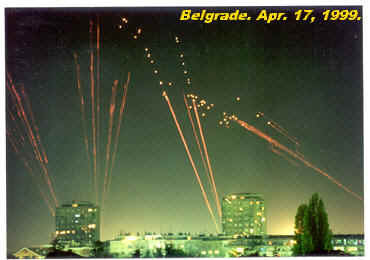 That Friday, Day 24 of NATO’s war on Serbia, NATO had launched its first daytime bombing raids on Belgrade. The air raid sirens went off mid-morning, just as this writer was meeting with the Serbian Patriarch Pavle, the head of the Serbian Orthodox Church. From then on, daytime attacks became routine. Such an escalation of war was a clear sign that NATO leaders were getting exasperated. The bombing was supposed to last 7-10 days and result in a surrender of Serbia, according to a pre-war estimate by General Wesley Clark, then the supreme NATO commander. Yet here we were, already in the fourth week of the war, and there was no let up in the Serbian resolve to fight back. A few months later, in September 1999, during my post-war Tour of Serbia (http://www.truthinmedia.org/Tour-de-Serbia-99/tim99-10-1.html), I also met and had breakfast with General Nebojsa Pavkovi in Nis, Serbia. As commander of the Third Army, Pavkovic was General Lazarevic’s boss at the time. After a cordial conversation with General Pavkovic and his top officers (General Lazarevic may have been among them, though I honestly do not remember him), General Pavkovic presented me with a book – recognition of my service to the Truth during the war (see the photo). Like Lazarevic, Pavkovic was also charged with and convicted of war crimes by the Hague kangaroo court. Pavkovic is now serving a 22-year sentence in Finland. Lazarevi was released on December 2015 after serving 2/3 of his 14-year sentence. So agreeing to that peace treaty in June 1999 while his army was still virtually intact was a STRATEGIC ERROR on the part of Milosevic, Serbia’s president at the time. Because it opened the door to NATO to march into Kosovo unopposed. And it ultimately cost him his life. It was just a matter of time before the tables were turned, and Milosevic, along with the Serb generals, ended up being rounded up and charged with war crimes by the Hague War Crimes Tribunal. Milosevic died there under mysterious circumstances in March 2006 (see Who Says There Is No Death Penalty at the Hague, Mar 11, 2006 – http://truthinmedia.org/Bulletins2006/Milosevic.html). Meanwhile, back to General Lazarevic, in recognition of his cunning military skills and tactics, he received a medal from the Russian Minister of Defense, General Igor Sergeyev, before being carted off to the Hague in 2005 to face the New World Order charges. So not only is Gen. Lazarevic qualified to teach at the Military College in Serbia for having made such fools out of NATO, if the NATO military had an ounce of humility, he should been invited as lecturer to the West Point and/or Sandringham. And now, with that as a preamble, check out my 2006 editorial, about NATO’s SECRET LOSSES – How Serbian Air Force Outwitted World’s Greatest Military Force and Inflicted Heavy Losses on NATO Planes, Helicopters and Personnel in Bosnia, Albania – http://truthinmedia.org/Bulletins2006/NATO_secrets.html. What followed was a wild and woolly Saturday night, Day 25 of NATO’s war on Serbia. Salvos of anti-aircraft artillery fire (AAA) filled in the audio gaps between detonations of NATO bombs and missiles. It was a horrifying symphony of death and destruction orchestrated from Brussels by one General Clark, and from Washington by one draft dodger Bill Clinton. Ground shook as the cold spring air whipped up by explosions occasionally swirled around this writer’s head like a mini-tornado. Belgrade was getting it, Novi Sad was being pounded (the second largest city in Serbia), Sremska Mitrovica was also taking heavy hits. But the worst off was Mount Fruska Gora, that lies between these three cities. It was being raked over by NATO bombers as if it were a meadow (click on the image left for a detailed map of this area and of the Balkans). It is a story about several daring counter-attacks by the Serbian Air Force during NATO’s war on Serbia. On April 18, 1999, they attacked and destroyed 17 NATO aircraft and 3 rescue helicopters at the Tuzla, Bosnia airport. On April 13 and 26, 1999, they staged one of the most daring raids since in Europe since WW II. Flying low, barely just the ground level to avoid detection in a coordinated mission from two airports, one in Serbia one in Montenegro, four Serbian Air Force Seagulls G-4S hit the NATO troops and the Apache attack helicopters at the Rinas airport in Tirana, Albania. All four returned to their bases unharmed. Don’t look for Hollywood to make a movie about it. Bill Clinton and his administration never acknowledged these losses in Tuzla and Tirana. But the fact that their planned Apache and ground attacks from Albania never took place speaks volumes about the effectiveness of the Serbian Air Force raids.